The S3ADSIQ200M12BC28HPC is an ultra low-power 12-bit dual-channel High-Speed SAR ADC IP. 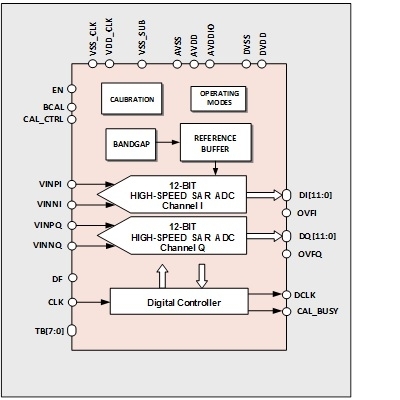 With a sampling rate of 200MS/s per channel, this 12-bit ADC features an excellent dynamic performance including -75.0dB THD, 63.5dB SNR and 10.2-bit ENOB (noise integrated up-to Nyquist bandwidth, including References circuitry noise contribution). It also features an excellent cross-channel performance including I/Q Crosstalk better than -75.0dB.